Coming from a 35mm 'Film' SLR Camera background, it never crossed my mind that my 35mm photography was true in relation to the focal range of the camera and lens, it's field of view, its depth of field and the final style or 'look' of the image. With the advent of digital, I bought a Canon 5D MK1 Digital Single Lens Reflex Camera a Canon 24mm MK1 f1.4 L Lens and a Canon 50mm f1.4 Lens............later I added a Canon 100mm f2 Lens. I had spent a great deal of time searching for a smaller digital single lens reflex camera and smaller 'prime' lenses but the 5D was the smallest available that had a 'Full Frame' sensor. I thoroughly enjoyed the 5D combo as it produced exactly the same style of images that my old film cameras had produced...........just like my film cameras, I started to take the 5D for granted as it was not getting in the way of my photography. Then it all went wrong..........the idea sprung into my head that the size of my Canon 5D kit was to large, it was heavy to carry around and the solution surely must be smaller lenses, smaller bag and perhaps a more discreet camera? I completely forgot that if I wanted a 35mm 'Full Frame' digital sensor then.........yes, the camera would have to be larger. The Internet Forums did not help, with the arguments for smaller camera versus larger DSLRs and all the innuendos that were included........."who wants a big camera and lens stuck in their face"..........."you know what they say he has to show of his manliness with a big lens".........."it has to be small and discreet on the street" So I spent a great deal of time purchasing 'alternative' crop sensor camera solutions and using the 5D less and less. I like the image style and just as important, the photographic control that I get with 35mm full frame which to a certain extent outweighs (if you pardon the pun) the crop series of cameras. However, it has to be said, that there is a place for my 'latest' smaller, lighter and less expensive camera with a crop digital sensor, the Panasonic GF1, especially as I cannot achieve a 35mm 'full frame' digital small lightweight set-up. The only other purchase that I had made which came anywhere near the mark for the correct size, weight, ease of use and produced the style of image that I enjoyed, was a secondhand Nikon FM3a 35mm 'Film' SLR Camera with AI-s Lenses..........I had travelled full circle and back to 'Full Frame'. I decided to compare the Canon 5D DSLR against my Nikon FM3a for size, each with a 50mm Lens fitted. The 5D had the Canon 50mm f1.4 USM Lens with a UV filter and Canon hood, the FM3a had a Nikon 50mm f1.4 AI-S Lens fitted with UV filter and Hama rubber hood. The Nikon FM3a was about the size and weight that I would like a 35mm Digital 'Full Frame' sensor camera to be and the 50mm AI-s Lens about the correct size and weight. When you start to look at a digital 35mm 'full frame' sensor camera like the Leica M9 and it's M Lenses, you find that it is very similar in size to the FM3a kit. The Canon 5D is larger, especially in body height but it is only when it is coupled with it's larger lenses than it really 'expands' to become a little inconvenient in size and weight. The kit itself is not to bad but when you add the Lowepro 'Mini Mag' AW shoulder bag the overall size becomes more apparent. It's June 2010 and I have once again checked all the latest digital camera releases, read the reviews; all with the sole and final solution in mind.........a 35mm 'full frame' sensor digital camera that can interchange 'prime' lenses and which is small and lightweight for carrying around. The only camera that fits the bill is a Leica M9 Digital Rangefinder and Leica M lenses but at a horrendously high price. 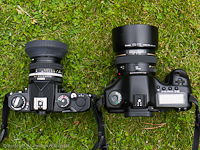 Sell all my kit and purchase a Leica M9 + Leica M Prime Lenses? Wait until the 1st quarter of 2012 to see what the manufacturers release? Continue to use the Canon 5D MK1 DSLR + Canon Prime Lenses? I finally decided to stick (for the meantime) with my Canon 5D Camera and it's prime 'fast' lenses. This kit was the nearest (apart from my Nikon '35mm Film' kit) that could emulate the Leica M9 + M Lenses solution albeit it was larger and heavier. The total weight came to 4.2Kgs. I have not used my prime lenses with the Canon 5D for over two years, barring the odd shot or two. During that time, I have mainly used my primes with the Canon 450D DSLR as I had tried to get the overall kit as small and lightweight as possible. Now I was back to 'Full Frame' and it was an interesting experience to pick up the larger and heavier Canon 'Full Frame' Camera. 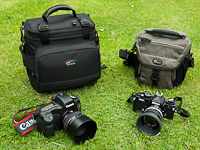 Out of interest I compared the Canon 5D with its three lenses against the Nikon FM3a kit and the shoulder bags that were required to carry them. There is a sizeable difference between the two but the bag of the Canon 5D could be 'considerably reduced' in size and weight, if one lens was removed and say the 24mm + the 50mm replaced with a Canon 35mm f1.4 L Lens. The first day that I started to use the gear, I was fully expecting to find that the overall weight would put a strain on my shoulder blade as I had slung the bag strap over my right shoulder to carry it around but this was not the case. I was pleasantly surprised........in fact the only weight that I experienced was when the Canon 5D with the Canon 24mm L Lens fitted was being carried by the neck strap for a prolonged period of time and the weight bore down on my neck and shoulders. This did not happen with the other two lenses and the bag itself was never a weight problem, especially when I was using the camera with a lens fitted outside the bag for taking pictures. Usually when I have used the 5D with my Canon 24-105mm L Lens fitted for travel photography, I have found the 'daily shooting' weight plays havoc with my arm muscles and neck but this did not happen with the 5D and any of my three primes fitted and in use. My prime lenses are a great deal shorter than my 24-105 L Lens and I think this has a bearing on the distribution of the weight to the arms and neck not to mention the back. You read about professionals who use the Canon 1D range of DSLR cameras and you often wonder if a 100% viewfinder makes a great deal of difference? Well, having used a Canon 450D DSLR camera for a long period with my prime lenses for the street, sport, wildlife photography and a Panasonic GF1 digital camera for casual use..........the Canon 5D which does not have a 100% viewfinder was a dream and utterly brilliant to use again. The Canon 1D viewfinder must be fantastic? The three prime lenses were fast to autofocus with the Canon 5D camera. For 'hand held' wide open shots I tend to use the 'spot' focus............using the AE to lock the overall image exposure to my liking, spot autofocus on the part of the image I wanted in focus and half pressing the shutter button to lock the focus and then re-aligning the scene before fully pressing the shutter fully down to take the shot. I tend to find that I use 'spot' focus more and more these days, even for 'hand held' landscape shots............it must be something to do with my aspirations to own a Leica M9 or perhaps it just makes sense? I also like bracketing exposures in very uneven light conditions and then selecting the best one. As a last resort, I may blend exposures where possible. The added bonus is that all the primes can be switched to manual focus and are very fast and easy to use. This is a heavier bag than most Lowepro shoulder bags but it is waterproof and all weather protected. It has been around for a good few years but it is seriously a 'professional' style bag with good solid padding and protection for my gear. It has a waterproof cover tucked in a special compartment and a strong carrying handle and shoulder strap. Its built to carry a larger DSLR camera than the Canon 5D, the camera sits in the centre with the fitted lens facing down (holster style) and a lens sits at either side of the two partitions (camera + three lenses in all). The 'Mini Mag AW' has a large front zip compartment for holding accessories with extra inner pouches built into the top and inside the lid. There is a zip 'folder' compartment on the outside on the back of the bag. The lid has a sturdy zip and it is also double secured with two webbing belts with click/clasps on the top. The bag is meant to be tough with its re-enforced fittings on the outside and thick padding on the inside. The downside, is that toughness means extra weight and the 'Mini Mag' is heavier than most similar sized Lowepro shoulder bags. The plus side is that I never worry about dropping this bag with my gear in it and with the outside webbing straps and clasps, I know it is never going to burst open and spill my gear, even in the 'extremely' unlikely event that the lid zip failed. This is my favourite lens because I love it's range for pulling in distant landscapes, portraits and it's great for a narrow depth of field at aperture f2.........sure it would be great if it were the size of a Leica Summicron 90mm f2 APO-M Lens but never the less it is very capable on the Canon 5D DSLR. I find this lens a real treat to use and when fitted to the Canon 5D DSLR, the overall weight does not drag down on my neck and shoulders when I use the neck strap. I can carry it in my hand for prolonged periods without any problems and its fast to autofocus, recompose and shoot. Some of the first shots were taken at the house and as usual my mother and the property were the subjects. The image of my mum was my first serious effort with the 100mm to capture a decent portrait. It was taken 'hand held' outside at ISO:100, aperture f2 and shutter at 1/6400sec. The main 'spot' focus area is on my mum's nose tip. I softened the 'RAW' image in post processing using Adobe Lightroom Version 3. I have just started to take portraits with the Canon 5D + the 100mm f2 lens and I prefer the softened look of the image. If I was to restore it to it's proper sharpness the nose and the front of the glasses frame would be in my opinion much coarser and not as nice. Its early days and hopefully my 'portrait' photography skills will improve? This next shot was taken 'hand held' in the back garden and the subject was a bird bath on the patio. It was taken at ISO:100, aperture f2 and shutter at 1/6400sec. The main 'spot' focus area is on the top front lip of the table. It was a sunny day and the light was reflecting of the bird table stand. This image was processed in LR3 with very light contrast and saturation applied. I finally used Canon's DPP Software to sharpen the LR3 re-sized web 'plate' image. The Canon 100mm f2 lens images have so much room for 'post processing' and the colours are great. I really like shooting the 100mm lens wide open and I am very confident of using the 'spot' autofocus of the Canon 5D at aperture f2........something I was never sure of with the Canon 450D DSLR. I never feel the need to take more than one shot with the 5D. The railing shot was taken 'hand held' with the 100mm at ISO:100, aperture f2 and shutter at 1/6400sec. The main 'spot' focus area is on the black hinge of the gate. The final image was processed using Lightroom Version 3, with slightly increased contrast and saturation. Again, I used Canon's DPP Software to bring up the sharpness of the lens on this LR3 re-sized web 'plate' image. Later in June, I went up to Peterhead in Scotland to visit my family and to hold my new grandson for the first time. It was a great day with good light and as I turned a corner just outside Peterhead I saw this scene of Boddam Lighthouse on the other side of the road. I stopped the car and captured this 'hand held' shot using the 100mm at ISO:100, aperture f8 and shutter at 1/500sec. I should have put on my '2 stop' 58mm graduated grey filter but I was late and I was a lazy photographer. The final image was processed using Lightroom Version 3, a 2.5 graduated 'software' grey filter was applied to the sky area with 'overall' increased contrast and saturation. Also I like sharper images and because LR3 has it's limitations..........I used Canon's DPP Software to up the sharpness on this LR3 re-sized web 'plate' image. When I arrived at Peterhead, I saw my grandson and held him for the first time............a great feeling............the moment carried me back some 25 years to when I held his dad. The occasion called for some family pictures and amongst the many images I captured, I like this one of the family together. It was taken indoors in natural light with the 100mm at ISO:200, aperture f4 and shutter at 1/100sec. The lens is so sharp at f4, I once again had to deliberately soften the image in LR3. The main 'spot' focus area is on the babies nose. The next day, I went down to the harbour at Peterhead and spent an hour taking pictures of the area and the people. It was not particularly a great day and the sky was overcast and grey. I used all my prime lenses and this is one of a boat taken with the 100mm lens at ISO:100, aperture f2 and shutter at 1/6400sec. The final image was processed using Lightroom Version 3, with slightly increased contrast and saturation. Again, I used Canon's DPP Software to bring up the sharpness of the lens on this LR3 re-sized web 'plate' image. The 'spot' focus is on the front section of the boat and I think the lens has produced a very nice narrow depth of field effect? Later I went for a walk with the family and enjoyed pushing my grandson in his pram. I took more pictures, in fact lots of pictures, to capture those precious 'first' moments with the new arrival. I later tried all sorts of post processing techniques with LR3 but this image, once again was softened 'for effect' as I felt that the original 100mm 'camera' image was a shade to harsh and sharp. The one thing I love about the Canon 100mm f2 lens is just how sharp it is wide open at f2 and all the way to f8. For some images I want the sharpness and it is available in spades. When it requires a softer approach, it is very easy to tone the sharpness down. Using the Canon 100mm f2 USM Lens is a lot of fun and I am looking forward to using it with my Canon 5D 'Classic' DSLR for 'street' photography. The narrow depth of field at f2 combined with the sharpness and a 'very decent' bokeh makes it a cracker. It is lighter and smaller than my Canon 24-105L lens as well as my Canon 100mm f2.8 USM lens and only becomes more noticeable when the hood is on. The hood, what a disaster.........it's great once it is fitted but putting it on is a nightmare. You have to pinch the two small recesses on the front (either side) with your thumb and finger to retract the small inner clips to allow it to fit over the filter or lens lip then release to lock on. Trouble is that by pressing (to heavily) the hood distorts its roundness and will not fit on.......I have had on occasions to use both hands to open the clips and to prevent the distortion by using the other hand to keep the hood in a round shape. This is a small criticism and certainly not a deal breaker...........want a very inexpensive autofocus/manual lens that can hold court with lenses of much greater cost.........that will be the Canon 100mm f2 USM Lens. The inexpensive and very much underestimated Canon 50mm f1.4 USM Lens is a little gem. Small, lightweight and without the hood very unobtrusive. I find this lens a real pleasure to use and when fitted to the Canon 5D DSLR the weight does not drag down on my neck when I use the neck strap. The hood is a dream fit with it's 'twist on action' over the filter onto the lens lip. In June, I used it for shots of Cammo Estate in Edinburgh along with the other two lenses and I found that it's focal range, depth of field and bokeh were very pleasant. This 50mm lens is about as small as it gets on a 'full frame' Canon DSLR and is very inexpensive alongside other Canon L zoom and prime lenses. It cannot deliver the narrowness of the depth of field than I get with the 100mm but there is a lot of DOF control at wider apertures and the image quality is excellent. This sculpture shot was taken 'hand held' at ISO:100, aperture f2 and shutter at 1/1600sec. The main 'spot' focus area is on the top middle front of the seat. This image was processed in LR3 with very light contrast and saturation applied. I finally used Canon's DPP Software to sharpen the LR3 re-sized web 'plate' image. The Canon 50mm f1.4 USM lens images have so much room for 'post processing' and the colours are great. This next shot was again at Cammo Estate and is an image of the old abandoned stables. I liked how the path disappeared into the distance and I thought it would be a nice test for the 50mm lens depth of field. It was taken 'hand held' at ISO:100, aperture f2 and shutter at 1/1250sec. The main 'spot' focus area is on the nearest left wall. This image was processed in LR3 with very light contrast and saturation applied. I finally used Canon's DPP Software to sharpen the LR3 re-sized web 'plate' image. The reason I use DPP is because I have no other software for post processing sharpness........it does a great job for web images. This lens is probably slightly too wide and I find it's use is limited for the majority of my photography. I think that a Canon 35mm f1.4 L Lens could replace both the 24L and the 50mm Lens in the bag. However, when the 24L is required, it delivers an excellent image on the Canon 5D DSLR and the 'full frame' sensor really makes good use of the lens quality. It has a terrible fitting hood which is very tight on the lens. When fitting and removing I must remember to use the flange edges of the hood (like your fingers acting as a screwdriver) because if you distort the hood by gripping the round part it will be difficult to fit on and take off. When I reverse fit the hood on the lens, I hardly make any turn and in this way it is easier to take off. This MK1 is no longer made and has been replaced by the MK2 model which delivers better CA control at wider apertures. In its day the Mk1 was purchased for slightly under £1,000 and the replacement model is now a great deal higher in cost. The 24L MK1 is a heavy piece of glass but its quite short in the barrel when the hood is not fitted. I did find that this lens was a weight around my neck with the Canon 5D and put a strain on my neck and shoulders when it hung there for a prolonged period. I found it easier to alternate carrying it between my hand and around my neck or both. Unless used for a specific subject, this lens is more than likely going to reside in my bag or left at home. Its a lens I would never sell, for it has its uses and the cost to replace it with the MK2 version is just not worth it.........for me. When I was up at Peterhead in Scotland, the weather (on the day I visited the harbour) was atrocious but I think the Canon 24L Lens caught the flavour? I used it for a couple of wide shots but I must admit it was the 100mm that I had the most enjoyment with. This shot of the capstan and the harbour was processed in LR3 and extra contrast and saturation were slightly applied. The settings were ISO:100, aperture f8 and the shutter was 1/320sec. The depth of field starts at the capstan and through to infinity..........it is not that clear on the larger image due to the wideness of the capture but it is in focus. This is a shot of the ruined farmhouse on the Cammo Estate using the 24L with its hood on. It was processed in LR3 and extra contrast and saturation were slightly applied. The settings were ISO:100, aperture f8 and the shutter was 1/250sec. The depth of field in this shot was excellent at f8 and covered the focus all the way through to infinity. For a wide lens, I am constantly surprised at just how much resolution is delivered with the 24L on the 5D camera. In the harbour 'capstan' image, the distant seagulls can be clearly seen and on the 'full size' RAW image the clarity of distant objects is quite amazing. I am not surprised that the replacement version MK2 is so expensive. I had used this MK1 lens for a couple of years on my Canon 450D DSLR which delivered a 38mm field of view with the 1.6x crop sensor and I had thought the image quality was outstanding but it paled in comparison to the IQ from the Canon 5D 'Full Frame' sensor camera. These two images are perhaps not the best examples of what this Canon 24mm f1.4 L lens can achieve but the mood of the day is caught, even although the harbour shot may not be to everyone's taste. I thoroughly enjoyed returning to my Canon 5D DSLR with it's 35mm 'Full Frame' Sensor and using Canon Primes lenses...........in particular the Canon 100mm f2 USM Lens, which I loved shooting wide open at aperture f2. Can I stand the size and weight of the kit or should I return to using the Canon 450D? Actually I can because apart from the weight of the Canon 5D and the Canon 24L Lens hanging around my neck during a prolonged period, I did not find anything else a problem. Sure the shoulder bag is larger than I would have liked and slightly heavier than most other shoulder bags but I was never worried about bashing my camera and lenses and it did not drag me down when I was carrying it. I must admit that the primes on the 5D were a lot of fun, even my rarely used 24L Lens which I found just a little bit to wide on the 35mm 'full frame' sensor camera. It's field of view of 38mm on my Canon 450D had been more to my liking and I had used it regularly on that camera. Did I miss my Canon 24-105mm f4 IS L Zoom Lens or my Canon 70-200 f2.8 IS L Zoom Lens..........of course I did for some of those shots that only a zoom would have caught........but then primes are different, smaller, lighter, great image quality and they make you work at your photography............most enjoyable and a great diversion from zooms! Can I find digital 35mm 'full frame' sensor technology and lenses that are smaller? Not at this time if I want autofocus and the flexibility of zooms and prime lenses. It will be interesting to see what Canon brings out in 2012 and perhaps a smaller and 'leaner controlled' DSLR camera with a 35mm 'full frame' sensor will appear. 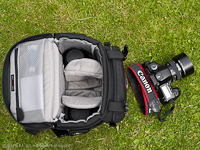 Since writing this article, I discovered and started to use the Lowepro 160 Rezo AW shoulder bag, which is even smaller, lighter and takes my Canon 5D DSLR the Canon 100mm f2 USM Lens and the Canon 50mm f1.4 Lens with spare battery, 58mm graduated 2 stop filter and spare memory card.